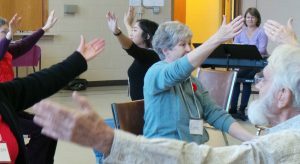 In each weekly hour-long dance class with musical accompaniment, elements of dance technique help to improve balance, build strength, enhance flexibility, and develop coordination skills. The sequences, either seated or standing, may help with cognition and memory. Each class is designed to accommodate the different abilities of the individual participants. The atmosphere is comfortable and accommodations are made with the help of volunteers. It is not necessary to bring a partner, however, caregivers are very welcome to participate as well. Opportunities for personal improvisation stimulate creativity and boost confidence, while partner and group dances foster social interaction and create a sense of connection. The enjoyable live musical accompaniment inspires physical and emotional expression. We begin seated on chairs where a variety of choreographed movements to music are designed to warm-up the body and focus the mind. For those who are able, the progression can go to standing and moving across the floor. Variations of these dance movements are adapted for anyone who wishes to remain seated. Participants are encouraged to wear comfortable clothing to move in and light running shoes with flat soles. Water is provided in class, although anyone is welcome to bring their own. Beeps for “meds-time” are no problem. Social time with light refreshments after each class fosters a sense of community. A family member, friend or caregiver is welcome to accompany the participant in both class and social time. Dr. John Burton, a nutritionist, supervises the social time.